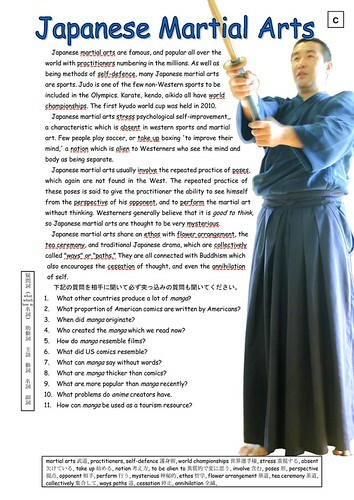 The partner page to the previous Anime and Manga page, which together form an information gap activity. The explanation is my theory of Japanese culture – that both manga artists, martial artists and all Japanese have ‘mirrors in their heads,’ a theory which originates in the teaching of the Kurozumi church, my analysis of Japanese mythology, and Japanese common sense. Can you see yourself? Can you draw the room in which now sit from a perspective in the top corner of the room? If you got into a fight would you be able to see yourself from the point of view of your opponent?